The recent questions and challenges raised within the public domain regards illegal qualifications by a splinter group proclaiming itself a professional council is regrettably creating much uncertainty and confusion within the fire and emergency sector that has triggered representations of SAESI before the South African Qualifications Authority (SAQA), The Council of Higher Education (CHE) and the Quality Council for Trade and Occupancies (QCTO). Following all of these fake news and engagements, SAESI within the South African context is recognised by SAQA as a trusted Professional Body and also recognised by the QCTO as the Assurance Quality Partner (AQP) of the Local Government Seta (LG Seta). In the International context SAESI is a voting member of the International Fire Services Accreditation Congress (IFSAC) since 1994 and is authorized to certify the globally accepted National Fire Protection Association (NFPA) Fire-fighter programs. SAESI outside of the United States of America (USA) is the largest Certification Entity in Southern Africa accredited for seventy (70) NFPA programs and is the first Entity in the world to be authorized to certify the Incident Command Programs of NFPA. The resent re-accreditation visit secured SAESI’s Accreditation until 2022 when the next IFSAC visit will take place. SAESI was founded in 1959 when the need for improving the standards of fire-fighting in South Africa was realised by members located within the dominant municipal employer domain. In 1985 SAESI registered six (6) levels of Fire Technology Qualifications with the juristic authority being the Human Sciences Research Council (HSRC) which was adopted as the “prescribed qualifications” upon enactment of the Fire Brigade Services Act, Act 99 of 1987 which read; “prescribe” or “prescribed” means prescribe or prescribed by regulation under section 15 or, except for the purposes of section 11, by guideline recommended by the Board and approved by the Minister; where in section (5) Chief fire officer.—(1) A controlling authority shall appoint a person who possesses the prescribed qualifications and experience, as chief fire officer to be in charge of its service and in section (6) Members of service.—(1) A controlling authority may appoint any person who possesses the prescribed qualifications and experience, as a member of its service to perform such functions as may be assigned to him by the chief fire officer. SAESI is also a member of the Fire Brigade Board identified in section 2(2)(e) where the Fire Brigade Board.—(1) There is hereby established a board known as the Fire Brigade Board, to perform the functions assigned to it in terms of this Act or the regulations contemplated in section 15. SAESI’s role in this qualification set the required examinations, marked the scripts and issued the certificates and the employer within its services established training centres that provided the education and training aligned to the qualification curriculum. Through the successive years of transitions and reorganizing of government services these qualifications became embedded within the career path of the fire-fighter within the municipal domain. The Department of Corporate Governance (DCoG) remains legislatively mandated to administer the Fire Brigade Act and recognises within its Municipal Staff Regulations. These qualifications which are voluntarily adopted by the private industry, maritime, military, aviation, rail, forestry and petroleum industries. These qualifications remain dominant, relevant and credible within the sector and are also internationally comparable. The SAQA Act in 1995 introduced academic reforms and introduced the qualifications framework which was later repealed and transitioned into the Skills Development Act of 1996 that introduced further reforms that mandated the Local Government Seta as the authority responsible for the development of education and training needs within the Fire-fighting Sector. SAESI in aligning with the changes handed over its distant learning program to National Colleges Limited T/A Success College to provide the distance education and SAESI as their partner set and marked the examinations and issued the certificates. This relationship with Success College prematurely ended in 2003 when Success College were unable to re-register the qualifications under their name with SAQA. 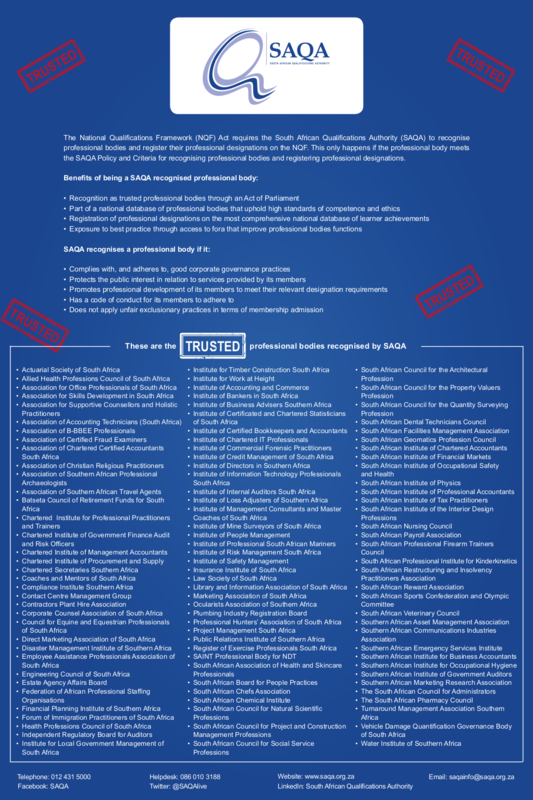 As SAESI is a member funded institute its members resolved to sustain the Success Distance Learning mandate not to prejudice its members career path and remuneration, whilst it collaborated with the juristic bodies mandated by legislation to develop and register the qualifications on the national qualification framework (NQF) of SAQA. At this point there are three (3) relevant Qualifications registered with SAQA, Occupational Certificate: Fire-fighter, NQF Level 4 (ID 98991) which articulates horizontally to Further Education and Training Certificate: Fire and Rescue Operations, NQF Level 4 (ID 57803), and articulates vertically to National Certificate: Emergency Services Supervision: Fire and Rescue Operations, NQF Level 5 (ID 64390). The current educational environment promotes lifelong learning and SAQA has accordingly published enabling policies for Recognition of Prior Learning (RPL), Credit Accumulation and Transfer (CAT) and various others that ensure all formal and non-formal learning is considered by education institutions that would enable learners to integrate and articulate towards professionalization. This allows members to engage directly with learning institutions and produce the SAESI Certificates for assessment that would translate to credit accumulation and access into required fields of study. All new qualifications developed must satisfy SAQA policy of international comparability and most short course proficiency programs of the NFPA standards are considered as benchmarks within the current development. SAESI members have over the years remained strong in their resolve not to become an education service provider and remain a quality assurance body as it represents the community of expert practitioners spanning the entire range of the sector that are best placed to ensure the standards of education training and development adds value to the protection of our people, their properties and our environment. SAESI engaged and is still attempting to engage with the only other role player presenting Fire Technology in the educational landscape, namely Tshwane University of Technology. Agreements came to regarding the development and presenting of a Distance Learning Programme that will both satisfy industry needs and serve the members have not been honoured by TUT as the programme would have been rolled out in 2017 already. Seeking written confirmation and further engagements with TUT in order to assist where possible in the interest of industry and our members have failed with no consultation or communique from TUT. 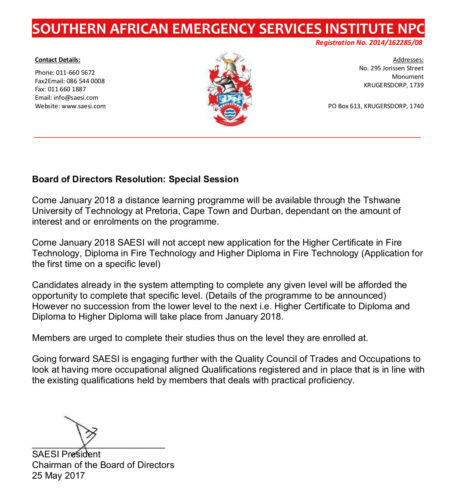 In the absence of this programme, SAESI has no choice but to continue with its in house education programme in Fire Technology to serve our members and industry. Members are therefore urged to attend and participate in meetings of their respective branches and management and not to allow themselves to fall prey to the deliberate negative misconception of SAESI being publicized on social media and other platforms. Members should ask themselves that if SAESI’s qualifications are all of a sudden illegal or invalid just because it is not on the NQF, then surely ALL Qualifications pre the inception of the NQF which will include all Academic Qualifications obtained also become illegal and invalid. 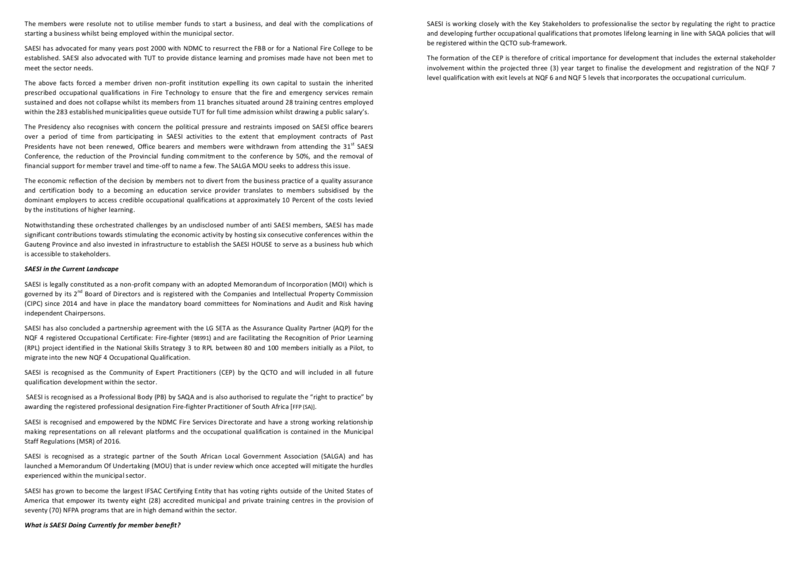 A letter from our CEO, Salome van den Berg, explaining the process of phasing out of SAESI examinations. The Q&A on the TUT learning, as received from branches. Any further questions you have, can be directed to us on info@saesi.com. The first pillar the delegate team ‘tackled’ was ‘risk management’. Schalk Lubbe got the conversation started with his presentation, suggesting a National Plan for Risk Management that is supported by all industry role players and partners. During the breakaway sessions, delegates were divided into two groups – one led by Marius Atterbury, Eskom’s senior fire and emergency risk management advisor, and the other by Peter May, senior advisor of fire risk and emergency management for Eskom Holdings, to discuss the topic at hand. Both groups agreed that a national risk management plan was definitely a good idea and worth working towards. “Informal settlements are here to stay and this risk requires an intervention to mitigate the loss of life,” – just one of the comments from the breakaway session. Various other great suggestions came from the sessions as the leaders (Atterbury and May) left no stone unturned in making sure everyone got to have their say (even the ones that were sometimes unwilling). From training on building materials to teach informal settlements how to mitigate the risk of fires, to suggestions of an early alarm system and better spacing between structures – delegates had a lot of ideas. In the end, the groups agreed that although a National Management Plan should be developed and cascaded down throughout the municipalities, they shouldn’t have to wait for an official plan to get started! The second pillar was investigated on 5 November, with Paul Motsepe, the West Rand District Municipality’s PIER officer, leading the way with his presentation on the Public Information Education and Relations (PIER) Working Group. He investigated the four pillars of proactive approach for community education individually (Public, Information, Education and Relation). Motsepe also looked at key tasks that have to be undertaken to up education in the industry. In the education breakaway session, groups had to discuss the current state of education. Both groups agreed that the education initiative is not currently community-driven and led, but driven and led by the respective local authorities, specifically the PIER group. However, there is a need for respectful consultation and inclusivity. Delegates stressed the importance of communities being addressed in ways that respects their beliefs and cultures. There is a problem with delivering what is thought to be needed versus what is actually needed. It was noted that the PIER programme is not utilised throughout the country and therefor a mandate should be instituted from national government to ensure that the programme remains relevant as the vehicle to assist in the reduction or elimination of the identified risks. Currently there is a lack of sustainability. Groups suggested that partnerships between all relevant stakeholders are vital for programmes such as PIER to succeed and that inter-departmental communication must be improved and resources distributed better to enhance education throughout. On the second day of the conference (Friday, 6 November), a noticeable amount of delegates have ‘disappeared’ but the remaining group took on the final pillar of ‘security and resilience’ with the same amount of vigour as the day before, determined to come up with a viable strategy. The session was kicked off by Mosia, presenting a talk on ‘International Standardisation in Security and Resilience’. He looked at the role of standards and stressed the importance clarity in standards. A breakaway session followed to look at who should all be involved in the making of standards and how these can be used to further security and resilience nationally. Both groups agreed that SAESI could be playing a more prominent role (many suggested a leading role) with regards to making EMS standards and a problem was identified with municipalities not doing what SAESI suggests. SAESI should have an increased presence in standardisation. And the delegates? What did they think? “I saw a well-organised event with a lot of information to absorb,” commented Mandla Kunene, fire officer of Engen for Health, Safety, Environment and Quality. For a full gallery of conference and other memorable moments visit Fire Online. What took place at during the official opening ceremony of SAESI 2015? Other highlights included the handing over of a cheque for R70 000 to Overstrand Fire, Rescue and Disaster Management, from Rosenbauer, as well as a cheque for Burns 4 Burns for R10 000, also from Rosenbauer. After the opening ceremony was concluded, the president opened the exhibition. For a full gallery of conference and awards visit Fire Online. After the conference, SAESI’s board looks at changes within the Institute and moving into the future. For nearly two years, a team of dedicated men and woman planned an event known as the Southern African Emergency Services Institute (SAESI) 2015 conference, exhibition and training events, with the theme of ‘Building resilient communities’. All the excitement built up to Sunday, 1 November 2015 when South Africa’s emergency management services (EMS) personnel set a world record by pulling a 19 tonne, fully-loaded fire truck for 1,5km up a gradient of 2,109%, verified by Power Construction. A fun run/walk followed, and the evening ended with the registration of the teams participating in the different events over the course of the week. All the members of the previous seven standing committees have been absorbed into these working groups and these working groups will be responsible for the execution of SAESI’s day-to-day activities. All the positions within the working groups will be open for elections during the annual general meeting (AGM) to be held in 2017. The question to be answered is: What does it mean to the members of the Institute, and what benefit does it holds for them? With a more streamlined structure, decisions can be taken faster. Relevant activities, like marketing, sport events and media, are now coordinated by one working group. If we can use the sport activities of SAESI as an example, we will now have one working group dealing with the organisation of the sport event, the marketing of the event, and handling the media coverage of the event. The first meeting between the coordinators of these working groups took place on 7-8 December 2015 at the Flamingo Casino. At this meeting, the finer details and working relationship between the working groups were finalised. With the registration of SAESI as a professional body, we expect to see growth in the Institute as we never experienced before. More than 50% of all firefighters in South Africa, professional and voluntary, are not yet members of the Institute. 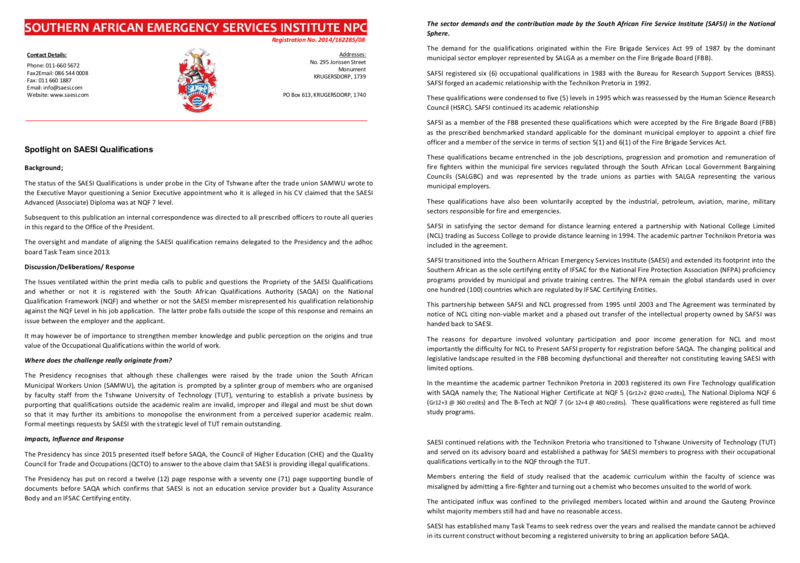 As SAESI is the only recognised institute for the EMS in southern Africa, we need to have all firefighters and other emergency services personnel as members.